Registration is now open – Black Friday Deals! Black Friday bring a friend sale! Register on Black Friday and get a second registration at 10% off! As a bonus, the first 10 orders will receive $5 towards the prize drawing! Announcing our 2019 Crop Because You Care event! We are Excited to announce this year’s Crop event will be held on March 9th, 2019. This year we have chosen to support the Mascot Miracles Foundation! This is an amazing organization that helps Families and kids get through tough times! The work they do is invaluable and we are honored to help in our small way! Thanks to all who attended CBYC 2018! We want to thank all of our 2018 CBYC attendees! We had a wonderful time last week seeing friends and making new ones. We are also grateful for your generosity toward UtahCASA. Your donations will greatly support the Special Advocates assigned to look after the best interests of foster children . We look forward to seeing you all next year! Crop 2018 is OPEN, just in time for Black Friday! Take 10% off your Crop Because You Care Registration! Happy Thanksgiving!! You have all been so patient so Here we go! Registration is now open! 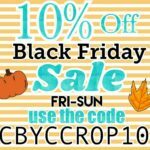 How about we “Crop” 10% off the registration for Black Friday!! Help us plan next year’s event! We had such a good time with you last month! Thank you for your support and your donations for Make-a-wish Utah! We would love to get your input for next year’s event! This survey is open to anyone who would like to attend next year. Don’t forget to check out our facebook page for photos from this year’s crop! The time has come! Registration is open! We are excited to announce that our Annual Crop Because You Care fundraising event is scheduled and registration is open! 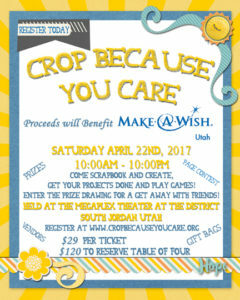 Crop Because You Care will be held on Saturday April 22nd on the second floor of the Megaplex Theater at the District. Please use the doors to the right of the main entrance. Check-in will begin at 10am. We are offering a number of T-shirts for purchase, with your registration. Shirts are $12 each and will be available for pickup at the event. Proceeds from this event will benefit Make-a-Wish Utah. Bring your friends and spread the word! We can’t wait to see all of you there! Crop Because You Care is a fundraiser where you can get away from the rigors of everyday life, create your scrapbook pages, visit with friends, and win prizes, all while blessing the lives of individuals and families. Check back soon for more details about our organization and upcoming events! Nadine Anderson on Welcome to our new site! Help us plan Crop Because You Care 2018!